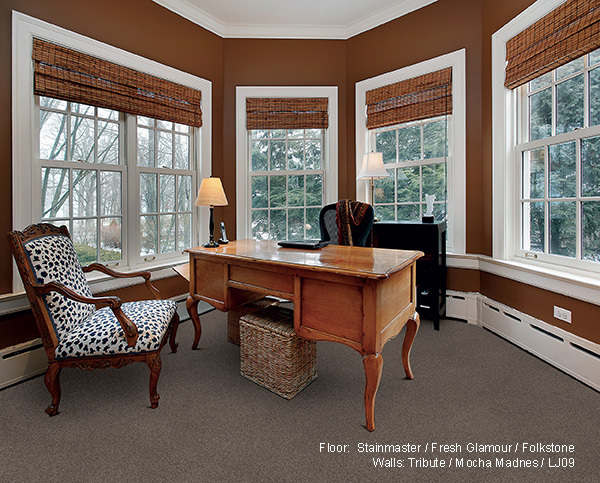 The color or design on the walls greatly impacts the way you feel about any given room. A baby’s room demands a fresh new color that welcomes him or her into the world. A living room should be warm and welcoming, with complementary flooring, walls, furniture, and lighting. When you’ve decided to refresh your home, it helps to go to a home improvement store that puts its customers first. Count on us for a great selection of wallpaper and paint in Long Island. Our experienced sales professionals are happy to listen to your goals, needs, and restrictions, and offer products and services that account for every item on your agenda. Expect quality products, superior customer service, and the best overall value in home improvements when you choose our store. a reputation for quality and longevity. Its vibrant and bold colors are matched only by its high-performance and versatility. 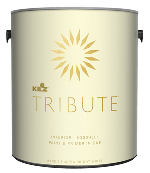 Tribute paints come pre-mixed with primer, which means that you can begin applying that first coat right after opening the can. Also, walls treated with these products can so easily be scrubbed and cleaned without losing their luster or color. 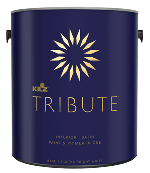 So when you want to create a room that is attractive and ready for everyday activities, Tribute by Kilz is always the smart choice. Your choice of paint adds greatly to any home improvement project you take on. When you visit us, you can explore a wide selection of vibrant, muted, pastel, and neon colors and hues. Our professionals provide you with the attentive service you need to choose your paint color with confidence. Depend on us for interior paint that appeals to your sense of style. We offer a variety of paint brands that appeal to all types of sensibilities. Our staff understands that each hue of interior paint sets a certain mood when combined with the rest of a customer’s décor. That’s why we work closely with you to determine your design goals and help you select the paint that best meets them. We are a trusted provider of Tribute by Kilz®, which is known for its reputation of quality, versatility, and longevity. This brand comes pre-mixed with primer, so you can begin applying the first coat with minimal preparation. This paint is also easy to maintain, as it can be scrubbed and cleaned without losing its luster. Choosing what type of paint you want in your home is not always easy. Would a flat finish paint, or an eggshell finish paint, or would something glossier be right for your walls? Trust our pros to advise you on how each product will look and perform. We’ll make sure your choice meets or exceeds your expectations. Contact us for any questions you have about our paint products and services. We proudly serve Franklin Square, New York, and the surrounding area.